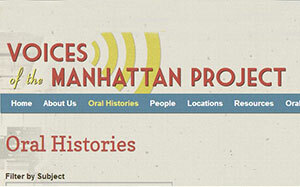 On Wednesday, February 20, 2008, the Atomic Heritage Foundation (AHF) and the Woodrow Wilson Center’s Cold War International History Project sponsored an in-depth discussion of the Manhattan Project and its Cold War legacy. The session featured William Lanouette and James Hershberg as well as veteran Robert Furman (pictured), who directed the first atomic intelligence unit. On Tuesday, February 19, 2008, almost 200 people turned out for a public meeting on whether to preserve the North End of the K-25 building. The session was held in the New Hope Center on Scarboro Road, Oak Ridge, a new facility with some wonderful displays about the early history of Y-12. On Saturday, January 5, 2008, a group organized by the Atomic Heritage Foundation enjoyed a matinee performance of “Doctor Atomic” at the Lyric Opera of Chicago. On Wednesday, December 5, 2007, the Atomic Heritage Foundation presented “General Groves Day” to honor General Leslie R. Groves and his Manhattan Project colleagues and dedicate the offices where they worked throughout the war years. On a beautiful Sunday afternoon in Santa Fe, the Atomic Heritage Foundation (AHF) hosted a program at the St. Francis Auditorium of the New Mexico Museum of Art to commemorate the 65th anniversary of the Manhattan Project. On Sunday, November 10, 2007 the Atomic Heritage Foundation hosted a Veteran’s Day program at the American Museum of Science and Energy in Oak Ridge, TN. A rapt audience of 175 listened as Manhattan Project veterans Colleen Black and Bill Wilcox told stories of life in the Oak Ridge when it was still a “secret city.” AHF president Cynthia C.
Brigadier General Paul Tibbets, the pilot of the Enola Gay when it dropped the first atomic bomb on Hiroshima, died November 1, 2007 at his home in Columbus, Ohio at the age of 92. A key player in the Manhattan Project, General Tibbets became a symbol of the controversial nature of the project in the 1990s, when the Enola Gay was displayed at the Smithsonian Air and Space Museum. On Wednesday, October 10, 2007, the Atomic Heritage Foundation, B Reactor Museum Association, and the Hanford Reach Interpretive Center celebrated the opening of new exhibits at the B Reactor in Richland, Washington.